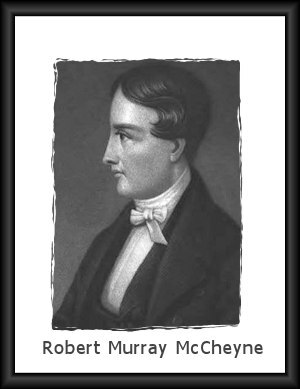 Robert Murray McCheyne (1813-1843) was a Scottish preacher of the Gospel who died "in the thirtieth year of his age and seventh of his ministry." Robert Murray McCheyne. Short biography. Robert Murray McCheyne. Biographical sketch. Robert Murray McCheyne, 1813-1843. Short biography. M'Cheyne and His Ministry: A Biography. Conversion of Robert Murray McCheyne. Robert Murray McCheyne: Chronology of Life. Portrait of Robert Murray McCheyne. eBooks about Robert Murray McCheyne. Reasons Why Children Should Fly to Christ Without Delay. Daily Bread, being a calendar for reading through the Word of God in a year. Robert Murray M'Cheyne [by] Andrew A. Bonar. Carlisle, Pa.: Banner of Truth Trust, [1960?]. Travel with Robert Murray M'Cheyne: In the Footsteps of a Godly Scottish Pastor by Derek Prime. England: Day One Publications, ©2007. Biography and travel guide. See more recommended Christian biographies.